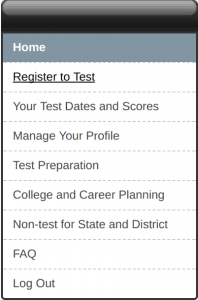 Need to register for the ACT? We’re here to help! You can register for the ACT by mail or online, and we’ll focus exclusively on the online option. Registering for the ACT online is much faster, plus you’ll be able to see live test center availability – it’d be a bummer to register by mail and find out that your preferred test site doesn’t have any seats. Lastly, after you register for the ACT online, you can print your test ticket and immediately put it on the fridge where it belongs. Check out our list of ACT Test Dates to see what’s upcoming! Head to the ACT student website, http://www.actstudent.org, which will redirect you to http://www.act.org/content/act/en/products-and-services/the-act.html. There are no other sites that allow you to register for the ACT, so make sure you’re on the official one! 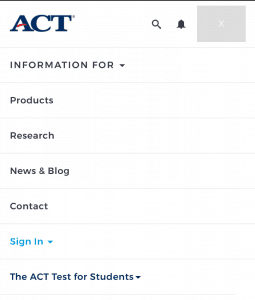 An ACT account will allow you to view your scores online, access your test tickets, make any changes to test registrations, and send scores to colleges. If you’re on a desktop computer, click the “Sign In” button at the top right of the page. If you’re on mobile, click the “Menu” button at the top right of the page, then “Sign In” on the dropdown menu. If you’re brand new, click the “Create Account” button on the left side of the page. Do: Use your full, official first and last names. Why? The ACT test proctor will need to match your test ticket with the ID you’ll bring to the test center. If the names don’t match up, you won’t be able to test! Secondly, you’ll eventually send your ACT scores to colleges, and they’ll need to match up your scores with your application. Don’t use a nickname on either, since it can cause problems later! Don’t: Use your school email address, since you won’t have access to it after you graduate, OR your parent’s email address. 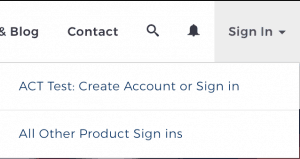 Once you’ve created an account or logged in, click “Register to Test” from the menu on the left. Here’s where the fun starts. If you have a disability that grants you test accommodations, choose “Yes” on the first screen. You’ll then choose whether you’re requesting accommodations for a National test date (testing in the US on one Saturday) or for Special Testing (more than 50% time extension, testing over multiple days, alternative test formats, or testing outside the US). You’ll receive an email from ACT within two days giving you next steps for accommodations. You’ll need to share that email with your school counselor (or other approved school official) who’ll confirm your accommodations at school. If you don’t have accommodations for a disability at school as part of an IEP or 504 plan, you won’t be approved for ACT testing accommodations. Enter YOUR email address at the top of the page. The only two options for gender are Female and Male. If you “are of Hispanic or Latino background,” respond accordingly. If you click “Yes” in the first yellow box, be prepared to receive lots of email and snail mail. This is a long, optional information section. ACT says that “It is designed to help you think about your educational future and to help colleges in their planning.” What does that mean? Your guess is as good as mine. Again, note that this entire section is optional. You can click “Continue” at the bottom of each page to skip entering the optional information. We’re back to some required questions. You can enter your “best language,” “first language,” and whether or not you receive English language services at school OR you can select “I prefer not to respond” (though I don’t see any reason not to). If you haven’t received English language services in high school, select “Other/Not Applicable” for the last required question. The interest inventory section asks you to rate different activities as “Dislike,” “Indifferent,” or “Like.” Yes, you can select “Dislike” for “Help rescue someone in danger,” but that would make you a bad person. The top of the page has links to informational documents for students who can’t test on Saturdays, students who are homebound or confined, and students who receive accommodations in school due to a disability. ACT will share your personally identifiable information when sending scores to colleges. They need to know whose scores they’re receiving. They’ll also send your scores and photo to your high school. You’ll need to submit a photo that meets ACT photo requirements (more on this later). ACT might take pictures or videos of you at test centers – for security, not brochures. There are lots of ways to get your registration cancelled (I count 31). ACT is picky about what you bring into the test center. If they think your scores are fishy, they may review your scores. If they’re still convinced your scores are fishy, they might invalidate your test. ACT can limit the number of times you retest. As of right now, that limit is 12. If you need to test 12 times, you might want to consider ACT prep. You aren’t allowed to share test questions. Once you’ve read the whole Terms and Conditions, click the box certifying that you are you and you understand the Terms and Conditions. Important: This page defaults to the next available test date. Look closely to make sure you’re signing up for the date you intend to test! If you intend to test on a later date, click the corresponding link from the top table. Choose whether you’re going to test without writing ($46) or with writing ($62.50). In either case, if you’re in the late registration period, you’ll pay an extra $29.50 late fee. You can choose online test prep, though we recommend one-on-one ACT prep, which has proven to be much more effective. 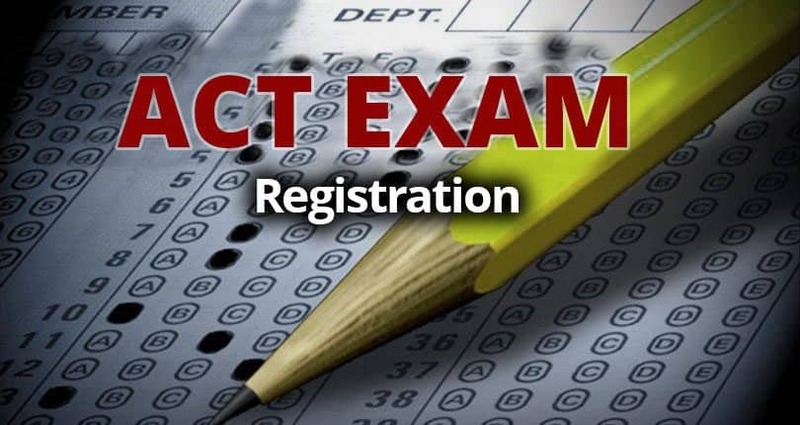 “Test Information Release” (TIR) is available for the December, April, and June ACT dates. If you purchase the TIR for $20, you’ll receive a fresh, unmarked copy of the ACT test you took as well as a sheet with your answers and test key. You can purchase an Official ACT Prep Guide here for $40.20 or you can purchase it on Amazon [link] for under $30. You likely don’t know your “high school code” off the top of your head, so search for your high school in the second yellow box. After you’ve found and selected your high school, select your current grade level. You’ll need to list which classes you’ve taken, are taking, are going to take, or aren’t going to take. A response is required for every single line, so if you can’t Continue from this page, check to see if you missed a line. You can use your transcript to fill out this page, though it’s not required. If you do choose to fill out the page, ACT will calculate a GPA for you and report it with your test scores to colleges. Take a second to verify that the test date at the top of the page is correct. You don’t want to go through this whole process and find out you accidentally signed up for the wrong date! You now have the opportunity to choose up to six colleges that will receive your scores. You can send up to four for free. In many cases, it makes perfect sense to automatically send your scores to schools. Don’t worry about bombing the test and having colleges deny you for one low ACT score! If you have an emergency during the test and are unable to finish, you can notify ACT and they won’t even score your test. Secondly, if you walk out and feel like you did completely bomb, you still have five days to return to this ACT registration and remove schools from the auto-send list. Note that if you don’t select schools to automatically receive your scores, you’ll have to pay $12 per score report, per school. Let’s say you’re applying to Amherst, Baylor, and Florida State, which all superscore. Let’s also say that you had three very different test results, and your superscore comes from all three of those test dates. You’ll pay a total of $108 just to send your scores to those three schools (3 test dates x 3 colleges x $12 = $108). Remember: you get four for free, and you can always remove them within five days of your test if you don’t feel good about sending. You can choose a major and occupation, or else you can choose Undecided and Undecided. Whether you choose actual options or Undecided, you’ll be asked to rate your confidence in that choice. Yes, you can be very sure that you’re unsure. You’re getting close to the finish line! Just like you likely didn’t know your high school code on page 11, you likely don’t know the test center code for where you want to test. Instead, enter your zip code in the second yellow box to find the test centers closest to you. You’ll see a list of the closest test centers to your zip code. These are NOT ordered by distance; they’re ordered alphabetically by location. Scan the list to find the most convenient test center, then make sure that the right column “Seats Available?” has a “select” button. If not, you’ll need to make another choice! Scan through this page to make sure that your information is correct. Some of this you can change later, but some of it you can’t. Page 20 – Money Time! Congratulations! You registered for the ACT. As soon as you’ve submitted your photo, return to http://www.actstudent.org and print out your test ticket. Put it on your fridge as a reminder! © Michael Jordan College Prep. All rights reserved.